Earlier this month, Mother Earth Brewing Co. opened a tasting room in the town of Nampa, Idaho, about 20 miles west of Boise. 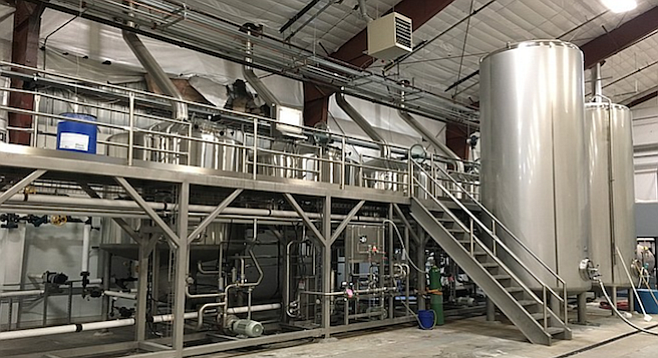 That's because in August the brewery fired up a 40,000-square-foot production facility in Nampa, capable of brewing over 100,000 barrels per year. By comparison, Mother Earth's main brewery in Vista can make about 40,000 barrels. So why Idaho? "That is the million-dollar question, literally and figuratively," says Mother Earth vice president Kevin Hopkins. "It has transportation corridors that work all the way across the U.S.," he adds, noting the Idaho brewery is already shipping Mother Earth cans and bottles throughout the Pacific Northwest and mountain regions — five and a half states so far. That half state, by the way, is Northern California. "From a craft-beer perspective," Hopkins asserts, "Northern California really is it's own thing. It's massive." For much of this year, Mother Earth was already shipping to these areas — including Idaho — from San Diego, to get a head start establishing the brand. "The reality is we started launching markets in 2016," Hopkins says. "Then we turn-keyed them. We actually launched them from the Vista facility, and then we handed them off." The real benefit of establishing production in Idaho will be seen in the first quarter of 2017, as Mother Earth begins moving eastward. Hopkins says beer is scheduling distribution to Denver, Chicago, and as far as Boston. "We're shipping beer all over the place," he goes on, "we're just dividing it north to south instead of leapfrogging from coast to coast the way other breweries have done." That's in reference to a recent spate of San Diego breweries building production breweries in Virginia to facilitate east coast shipping. Virginia governor Terry McAuliffe even visited San Diego to personally lobby Ballast Point to build there. Hopkins says there was no such activity on behalf of Idaho, but that state and local officials have been easy to work with, and the community has been receptive. While the new brewery is much larger than Mother Earth's Vista brewery, the new tasting room is modest compared to it's Vista Village taproom, meant to offer beer to the local community rather than be a satellite destination. "We're not building a Disneyland-type facility," he says, "we built a large, robust, fully functional brewery."